Approaching Renzo Piano’s Modern Wing at the Art Institute of Chicago, from Michigan Avenue. That’s it on the right. The “flying carpet” stands out. Reminds one of a cross between a cantilevered Frank Lloyd Wright roof, and a Miesian modernist flat roof. And flying across Monroe Street is the Nichols Bridgeway, designed by Piano. A straight pedestrian bridge, contrasting with Frank Gehry’s curvy, winding bridge, which also originates in Millennium Park. But I say close Monroe Street, the street between the Art Institute and Millennium Park. Make the park a sculpture garden of the museum, and make it easier to get families from the park into the Art Institute. When they close the street for repairs or any reason, the cars simply go around and take another route. It’s not difficult. Maybe with gas prices going up we’ll realize that cities are not for driving through anyway. Back to the Art Institute. 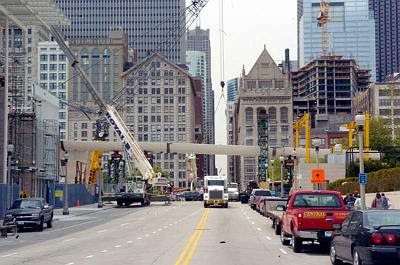 A friend says the Nichols Bridgeway currently looks like an arm in a sling. That’ll change when the stainless steel mesh is installed on the sides. Here’s how it meets the Art Institute. Looks a little clunky for now, like an add-on, which it was. But we’ll wait to see. Those I know who’ve been up there say the views are spectacular, of the buildings on the Michigan Avenue streetwall and of Millennium Park, especially of Gehry’s bandshell and trellis. The experience of rising up above the city, through the trees, seeing the lake and crossing the street should also be thrilling. A little like rising up vertically and forward in Renzo Piano’s escalators at his (with Richard Rogers) Pompidou Center in Paris. That having been said, the building, while a winner, is too large and tall for its park setting. Particularly when seen from the east. From the lakefront, or from Columbus Drive, built Chicago used to stop on the west side of Michigan Avenue. Now, with this behemoth, the built environment encroaches a couple of blocks closer to the lake. Into the park. Into the much needed open space parkland of a big noisy city. And is that east wall of the Modern Wing nearly windowless? Add this structure to the list of what’s been going up in Chicago’s lakefront parks and you have a disturbing trend. The enlarged Soldier Field. Millennium Park. The Notebaert Nature Museum. Even the kiosks around Buckingham Fountain. All are worthy. Some are great places, amenities to the city in their ways. 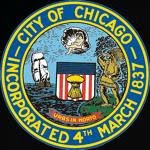 But we can not abandon or trample on our “Forever Open, Clear and Free” lakefront. The latest battle of course is the Children’s Museum which also wants to build at the end of Gehry’s bridge in Daley Bicentennial Park. Reminds me of Washington D.C. where the National Mall is being overbuilt with war monuments and other construction. Of course the views from the inside the Modern Wing of the Art Institute will be good, given its once-protected park setting. The facade seen from just inside Millennium Park. You see aluminum, steel, glass and- Indiana limestone, that last blends with the Art Institute’s 1893 Beaux-Arts building to the right. If you closed Monroe Street you could continue this “creek” up to (and into!) the new Modern Wing. Piano’s roof looks neoclassical, as at an Italian villa. The facade is so clear to read, in a modernist way, like the Chicago street grid, or the surveyor’s plots. 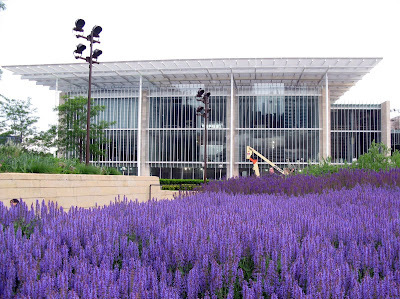 Remember, Chicago’s official motto is “Urbs in Horto” – City in a Garden. I say more horto, less urbs on the lakefront from now on. But this building, in its quiet elegant way is a beautiful sculpture itself. Here it is at the “magic hour” of dusk. The thin columns look like pencils or paint brushes. Piano’s “flying carpet” roof is to provide interesting, changing light in which to view the art in the galleries beneath it. It’ll be filtered through this steel mesh, and through translucent vellum. The light should appear alive and make the rooms, and the art, breathe. And from well inside Millennium Park. From underneath Frank Gehry’s trellis at the bandshell in Millennium Park. Update: Blair Kamin gets an inside look at the as-yet-unfinished galleries. a building I once walked through with Renzo Piano, as he expressed his admiration of it to me. You are currently browsing the archives for the Nichols Bridgeway category.